Life is Good... At the Beach: It has arrived!! The newest addition in "The Mother of All" series! I should start by saying how I was first introduced to Ann Douglas. We are going back quite a few years now, lets say... six or maybe almost seven. Hubby and I had finally come to the time when we were going to get pregnant. We had a plan. We would stop birth control and a few months later we would be pregnant. We were picking up a few things at Costco and I was browsing the books, like I love to do. And to my surprise there was a pile of books called "The Mother of all Pregnancy Book". The first thing that caught my eye, other than the word "pregnacy" was the Canadian Flag. I was sick of flipping through books on how to get pregnant and have all sorts of American stats thrown at me. Not that I don't love Americans, I do, they are family. But, our medical system is somewhat different, so not all the information applies to all of us. I decide to pick up the book. I hid it in my nightside table, away from parents or step-children, and started to read it. I loved the way the words just flowed. Ann spoke to me like I was a friend chatting it up over coffee. Trying to get pregnant is so easy for some, but for others not so good. I read only to the point where you actually get pregnant, promising myself that I would read the rest when I was pregnant. Months go by and nothing happens, we start going to see specialists and our route of infertility begins. I turned back to Ann's book on a daily, regular basis. The first time I read the book, I skimmed over the troubleshooting area. Not thinking that we would be having any problems. But, once problems were diagnosed, Ann was able to explain to me exactly what was wrong in plain english that I could understand through my anger and tears. Fast forward. We go through our ivf and get the positive beta that tells us indeed that we are pregnant. The first thing I did, other than call Hubby and a few girlfriends was pull out Ann's book and read the rest. I referred to it throughout my pregnancy. I loved it so much that I started purchasing it for friends who were talking about getting pregnant. And I will say, thankfully, that all followed my lead and read the first half first, then waited, and within three months all were pregnant. I also make sure to throw in "The Mother of all Babies Book" for their showers. Long before, I had ever heard of Blogging, I felt like I knew Ann so well. She was with me for so long trying to get pregnant. Flipping through pages all the time, made me feel like she was right there with me, holding my hand. Then, a girlfriend of mine started up this blogging thing and introduced me to Ann's Blog. I have now met Ann a few times and chatted through email, blogging and on the phone. 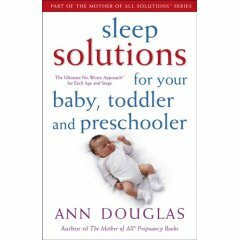 Ann is one remarkable woman and I feel honoured that I was able to contribute some of my thoughts on sleep ,or lack there of, for her newest addition "Sleep Solutions for your Baby, Toddler and Preschooler: The Ultimate No-Worry approach for Each Age and Stage". I haven't finished it yet, I was too busy taking a nap, but know that it is full of real life wisdom and suggestions. And I can't wait to read the Toddler section, in hopes that we can reset the clocks here. Thank you Ann, for being so good at what you do. For having the gift to put words together so well. And for sharing in our lives as we all learn to take on the role of parents. Isn't it a Great BOOK. I'm reading it now. I wish i had it when Miranda was a baby and then maybe I would be better at getting my kids to go to bed. LOL!